An early morning start – at the station by 7:40am, for an 8:30am start, then bagged a seat, got a coffee and waited for departure to Croydon, 155 kms away. There was the rail motor and two carriages. The front rail-motor was full, so we chose the next one. In retrospect, it was just as well we did. 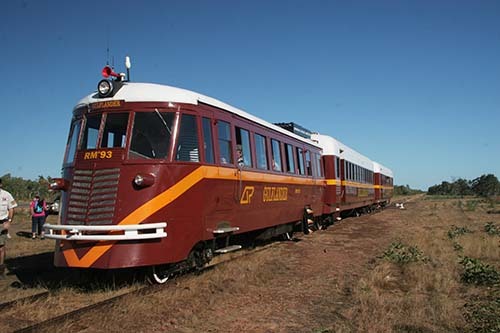 We found out that we were in The Commissioner’s Car, fully restored, with large leather seats, tinted windows and plenty of leg room, and a much smoother ride than the rail-motor. As we travelled along these specially designed tracks, we noticed how much the rail-motor (and its passengers), were thrown around. We felt a very bumpy trip, but it must have been worse in the first rail motor. They had a better view however, as there were windows showing the track ahead. The track sleepers are hollow steel, filled with a mud slurry, without ballast (hence the bumpy ride). It was built this way to withstand the termites and the floods. Because the rails are all that stands above the ground, the floodwaters just flow over the rails, rather damming up and then eroding the ballast. The train can still travel with 150 mm of water over the rails. 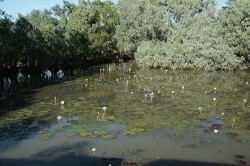 Some of the waterholes had water lilies in flower floating on the surface. 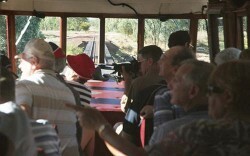 Ken, the driver, gave a very interesting commentary and we learned about the history of the railway, the discovery of gold in Croydon, the names of the many different varieties of the ever present trees, the waterholes, the abandoned towns, the characters, and much more interesting information. 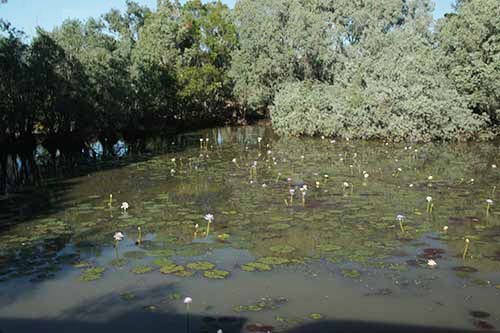 We crossed the Norman River, where Ken said that campers ignorantly set up, not being aware of the crocodiles. We stopped at Black Bull Siding for morning tea, this was a cup of tea or coffee using hot water from the trains radiator, and a lovely moist muffin. Ken slowed to show us the flood levels on a marker post, 1974 being the highest and well over the height of the train! Things come to a standstill in ‘the wet’. This is the time they go on holidays, or do restoration and maintenance to the rolling stock and the track that is not flooded. 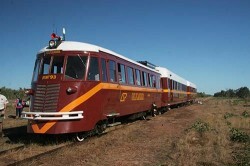 The railway is maintained by the Normanton team, as is the restoration of carriages, and the development of their museum. The Normanton Station is an absolute picture of greenery, with a lovely garden, hanging baskets, a green lawn and a feeling of welcomeness the minute you enter. After morning tea (tea, coffee and a muffin) at 11:15am, we bumped our way along, arriving at Croydon at 1:30pm. We headed off to a BBQ area, 3+ blocks away (uphill) from the station, and found a shaded gazebo, empty table and a spotlessly clean BBQ. We cooked our sausages, had them in a fresh piece of white bread!!! and relaxed until it was time to go down to the bus stop. Unfortunately, depite booking 2 weeks early, we got the un-airconditioned bus, while the first lot got a Greyhound couch!! No justice in this world. We arrived home at 5:20pm, feeling very happy, with money well spent. 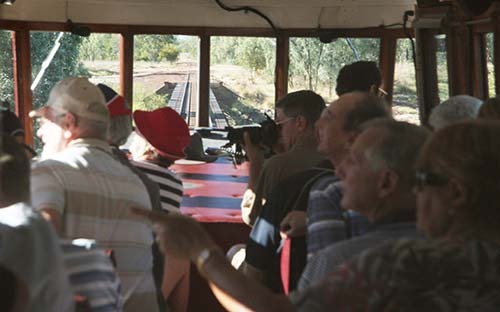 Part of the enjoyment was the knowledge that this train had been operating continuously for 123 years and that most of the track was unchanged from the day it opened. The train was different, but the speed it travelled was the same as it was in 1891, complete with all the bumps, we felt a real part of history. Today, we roasted a large piece of rump in our Cobb charcoal oven, afterwards using the remaining coals to cook a carrot cake. Russ iced the cake, so it was mostly icing! The cold rump with salad was delicious. I made potato salad and a coleslaw – it’s too hot for a roast dinner and gravy. We are leaving tomorrow – not taking advantage of our ‘free night’ (if you book a week, you get a free night). 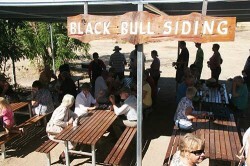 We are sick of the dirt and the Gulfland Motel and Caravan Park leaves a lot to be desired. Although it has just been sold, so things might be looking up for this place. It certainly was. Thanks for your comments – they mean a lot to us.